Luke likes to take red peppers home from the organic grocery store near our house in Northport. What to do with all of those peppers? Roast them, of course. 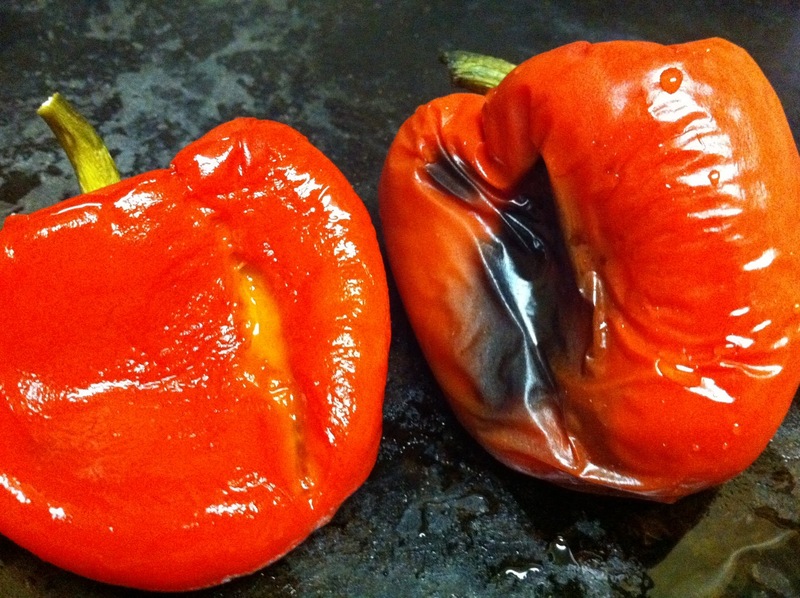 If you love roasted peppers, do it yourself. Everything is better homemade: it’s the love! Here are my gorgeous peppers. The one on the left is peeled already. The one on the right still has the skin on so you can see the char and that it is kind of shrunken. This is what they will look like when you take them out of the oven. Use them in soups, pasta, sauces, hummus, etc. Will be using some this week, so stay tuned! Place peppers on a baking sheet lined with tin foil. Roast them for 40 minutes. Take them out and wrap them up right away in the tin foil and leave them to cool completely. They will sort of steam themselves out. When they are completely cool, peel away the skin. It should come right off. Take out the stem and seeds. I've done it a couple of times and it's a fun thing to do in family. Although I would burn my fingers… It must be much easier when you wait for them to be completely cool.